Press release of the South London Solidarity Federation ahead of the November 24th 'Day of Action' against cuts in education. Students walking out on 24th November should avoid being trapped outside the Lib Dem HQ, says one of the groups behind the Radical Workers and Students Bloc on the 10th November demonstration. Instead, according to South London's branch of the anarcho-syndicalist Solidarity Federation, those taking action on this day should hold roaming marches blockading general economic targets. By attempting to occupy the Liberal Democrat HQ, students and workers are likely to be confronted by a much greater show of police force than was encountered at Millbank Tower. 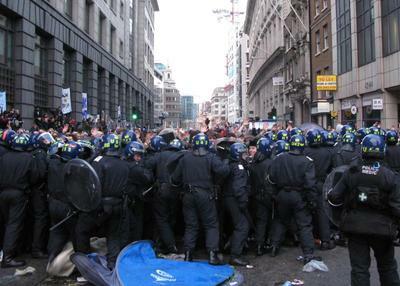 The Metropolitan police were left red faced by the trashing of the building containing Conservative Party HQ and will be looking to ensure that those events are not repeated. Anyone going there risks being kettled and quite possibly feeling the wrong end of a truncheon. To keep the movement growing we need to spread throughout the city bringing it to a standstill. The British economy depends on the flows of capital, commodities and information, and it is by blocking these flows that students, school children, benefits claimants and others without the ability to withdraw their labour from a workplace can disrupt business as usual. One participant in the walkouts said: "We're all going to Trafalgar Square for the demonstration, but what's the point of taking the bus, we could march and block the streets". The British economy depends on the flows of capital, commodities and information, and it is by blocking these flows that students, school children, benefits claimants and others without the ability to withdraw their labour from a workplace can disrupt business as usual. An anarchist group had called for "roaming marches" to "disrupt business" across central London, rather than a static stand-off with police.